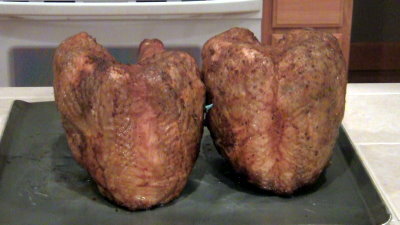 This is my 2011 Thanksgiving day Turkey recipe. Hell, I will probably use this brine next year as well. First clean and prep the turkey. I started with 2 young 7 to 10 lbs. Turkey's with the the legs. thighs and wings removed. I do this because w like the white meat only. We buy them already processed this way, so nothing gets wasted. Wash the turkeys under cold water. Now put on some food handling cloves and mix 1 lbs. Mad Hunky Poultry Brine mix with 1 gallon cold water in a large tub or pot. The tub or pot should be large enough to hold the two turkeys but small enough that the brine keeps them submerged. Add some ice and place the pot or tub in the fridge to brine for 8 to 10 hours. I went with 4 hours on this cook as I was pressed for time. The flavor was still amazing. Larger birds around 12 to 14 lbs. should brine for 10 to 14 hours. I brined one for 14 hours and it was crazy good! Once the birds have soaked in the brine remove the birds from the brine and rinse them thoroughly with cold water. This is a great time to get your cooker pre heating. 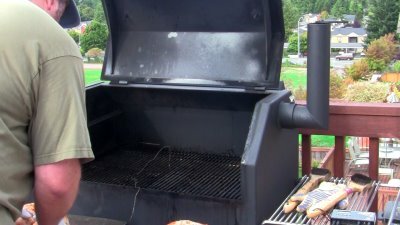 Pre-heat your smoker to 230 degrees. In this cook I used BBQr Delight Sugar Maple pellets. In a mixing bowl melt 1 1/4 stick of unsalted butter. The microwave was my tool of choice for this task. 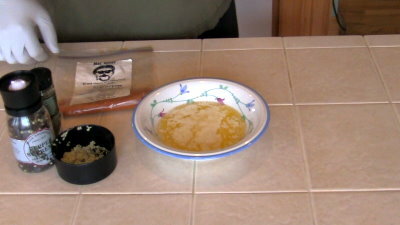 Once the butter is melted add 3 cloves chopped garlic, 2 tsp basil, tsp Mad Hunky Rub, 1 tsp pepper and mix it thoroughly. Next loosen the skin from the meat by running your finger under the skin starting from the neck area down. Do not go all the way down as we want to create a pocket to hold the butter mix under the skin. Place two large spoonfuls of the butter sauce under the skin on each side of the bird. Using your fingers spread it all over coating the meat. The remaining butter sauce can be spread on the outside of the skin. Rub 1 clove chopped garlic on the outside of the skin. That's 1 clove per bird. Now it's time to apply the Mad Hunky Rub. This is the final seasoning we add. From this point on it's all about slow cooking. Shake the Mad Hunky Rub on to taste. You can substitute the Mad Hunky with your favorite rub. That said I highly recommend you stick to this recipe as it flat out rocks! Once the smoker is up to temperature and your birds are prepared, put the birds on the grate and get to smoking! Once the skin starts to brown, check the temp. When the birds reach 140 degrees I like to turn the heat up to 270 so the skin doesn't end up rubbery. Remove the birds when the internal temperature reaches 170 degrees. This usually takes about 4.5 hours of cook time. That's it! This is a very easy recipe to follow and will produce "Mad Hunky Good" results.